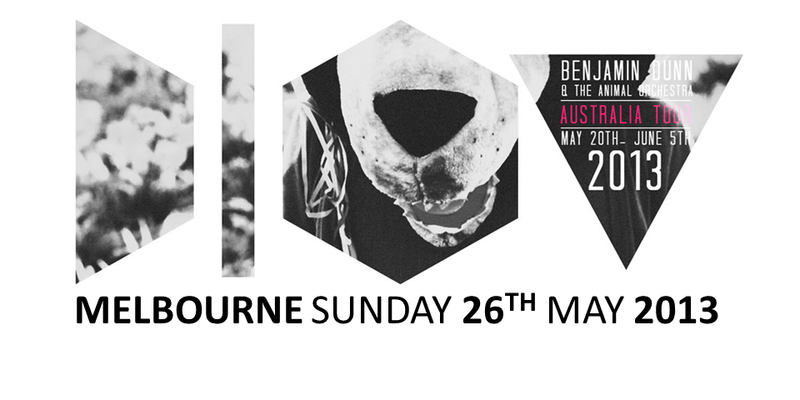 Introducing Benjamin Dunn and The Animal Orchestra. With a merging of vintage synth-driven dance, electro- pop and eclectic instrumentation, Dunn consistently reinvents his sound following his ever-evolving artistic vision. Benjamin Dunn and The Animal Orchestra achieve a rare fusion of innocence and sophistication on their album Fable. These songs reveal considerable craft both lyrically and musically, even as they capture a childlike sense of wonder. Dunn explores themes both directly and through fantasy characters, and something more idiosyncratic. Supported by Melbourne’s very own Coby DeMaria who Infuses musical styles from folk, rock, pop, gospel, soul and everything in between, her gifts of musical arranging and vocal directing come to the fore in the beautifully constructed songs she produces. Coby’s new album, produced by Andy Sorenson - set to be released mid 2013.